Spinach contains iron, or is that a myth? If you used to watch Popeye, you’d think it would, anyway. Because, according to Popeye, the spinach gives iron muscles and you will get strong. But did you know that Popeye eating spinach was actually a publicity stunt by the U.S. government. Popeye was popular at the time around the Second World War. Because the government did not know how long the war would last and because of possible shortages of meat they wanted to persuade the population to eat something else: spinach . And it helped. There was an increase of 30 % more spinach that was eaten in comparison with earlier years. Spinach, by the way, contains Iron, more than the average in any other vegetables, but much less than is often thought. And iron is an element that we need in our diet. And so today a delicious spinach filo dough snack, with a delicious taste and with iron! This weeks question: in cookbooks is often spoken of baking powder and baking soda. What are these ingredients and can you interchange them? Baking powder is a chemical agent. To be precise, a carbonate combined with a bicarbonate and it is slightly acid (because of the addition of tartaric acid or citric acid). In your dough or batter it reacts with moisture. It gives lightness in your final recipe, but also increases the acidity . When you want to store it, make sure it stays dry or it starts to work in your bag. Baking soda is like baking powder a chemical agent which consists only of sodium bicarbonate. So it has no acidic component (as in baking powder). The acid will be added to the dough or batter. When using baking soda in a recipe , you’ll always see an acidic component (vinegar , lemon juice , buttermilk) to start the reaction. I do not have baking soda in the house I can replace baking powder ? Use 2 times as much baking powder as baking soda in the recipe (if the ingredient list gives 1 teaspoon baking soda, add 2 teaspoons of baking powder) . The acidic component in order to start the reaction, should be replaced by a non-acidic ingredient . For example buttermilk becomes milk , vinegar / lemon juice becomes water . Please note that even though they work the same, the taste will be slightly modified by replacing. So rather buy baking soda for the recipes that need it. Put the raisins in hot water for 10 minutes. Put a pan on the stove and bake the shallots in a little oil for 3 minutes. Add the pine nuts and roast another 5 minutes. Meanwhile, wash the spinach and add it with adherent moisture to the pan. Let the spinach shrink and remove from the heat. Mash the feta cheese in a small bowl. Add the egg, the drained raisins and spinach mixture and mix well. Then add the breadcrumbs and mix a last time. Take a sheet of filo pastry and cut it into three. Lay a strip for you and spoon 2 teaspoons spinach in a corner. Fold the dough inward so you get a triangle. Fold up (a new triangle), and so on until your filling is completely wrapped in phyllo dough and you're having a triangle in front of you. Glue the last bit of phyllo dough together with some water . Fry the spinach snack at 180 degrees Celsius for 3 minutes or you can fry the snacks in a pan with a layer of heated sunflower oil. Bake the appetizers than 3 minutes on each side until golden brown. Allow to drain on kitchen paper and serve immediately. Yes, it’s almost vacation! Is yours coming soon to? Or maybe you’ve already have holiday free time. In the Netherlands we go in three different waves on holiday time. For this year we have the very end in the South. An additional advantage (because every disadvantage has its dvantage) is that we are also very late to go back to school. And a week before we go to school here children’s holiday week. Do you have one to? It’s a week which is organized for the children from our village, with all sorts of fun activities. Games, building huts just a week full of fun. This year I help organizing this holiday week, and I can assure the children will have a lot of fun. We have an activity program from early morning till late evening. And now you may be wondering why I tell you this, but in this case, the potato dish with minced really is a godsend. Few dishes to wash afterward (because in this week I almost cant lift a pan anymore in the evening) and finished quickly. And with a delicious Greek touch for the vacation accent. If you start with potatoes (not slices): peel the potatoes, wash them well and cut them into slices. Bring a pan of water to the boil and cook the slices for 10 minutes. Drain in a colander. Melt the butter in a pan and fry the potato slices in four batches until golden brown and remove them with a slotted spoon. Spoon the bacon in the pan, stir-fry for about 1 minute, then add the minced meat, thyme, paprika and salt and pepper to taste. Fry well until the mince is done. Put the ground beef in a bowl and mix in the raisins. Put 1/3 of the meat at the bottom of a deep skillet (with lid). Cover with half of the potatoes and then 1/3 of the minced meat. On top of the ground beef you divide the slices of zucchini. Sprinkle with oregano for even more flavor. Then a layer with the rest of the potatoes and top it of with the minced beef. Scatter the cherry tomato on top and put the lid on the pan. Let the pot simmer for 20 minutes. Meanwhile: Make small pieces of the feta cheese and mix it with the yogurt. Remove the lid from the pan and pour the yogurt cheese mixture on top. If you find it tasty garnish with paprika. In Greece, it’s a tradition to bake a Greek Easter bread known as Tsoureki for Easter breakfast. It’s a sweet, spicy brioche bread decorated with colored eggs. Mostly red colored eggs, but since I prefer to use a natural colorant, these eggs were colored with turmeric (250ml water, 2 tablespoons turmeric and 1 tablespoon vinegar) and become beautiful yellow. Add half the flour, sugar, yeast and milk in a bowl and mix until well blended. Place a plastic foil over the bowl and let it stand for half an hour in a warm place until air bubbles appear. Brush a bowl with butter. Take the dough and add the eggs one at a time, while mixing. Add the second egg when the first egg is incorporated. Cut the butter into cubes and add them, while continuing to mix, block for block. Finally you add the salt, cinnamon, anise, zest, lemon juice and vanilla extract. Continue mixing until you get an elastic dough and place the dough in greased bowl. Place a plastic wrap over the bowl and leave for an hour in a warm place to rise. Press the air out of the dough and divide it into three pieces. Roll each piece of dough into a roll of 35 cm in length. Braid these strands loose, so you get a braided bread. Line a baking sheet with parchment paper and place the bread on the paper. Cover with plastic wrap and let it rise for 60 minutes until the dough is doubled. Meanwhile, preheat the oven to 200 degrees Celsius. Bake the bread for 10 minutes and remove it from the oven. Divide the eggs over the bread and press them into the dough. Brush the rest of the bread with beaten egg. Put the bread back in the oven and reduce the temperature to 180 degrees Celsius. Bake for 25 minutes, remove from the oven and let cool on a rack. This healthy and delicious Greek pasta is made with tuna. A fresh tomato sauce with delicious herbs covers the creamy pasta. 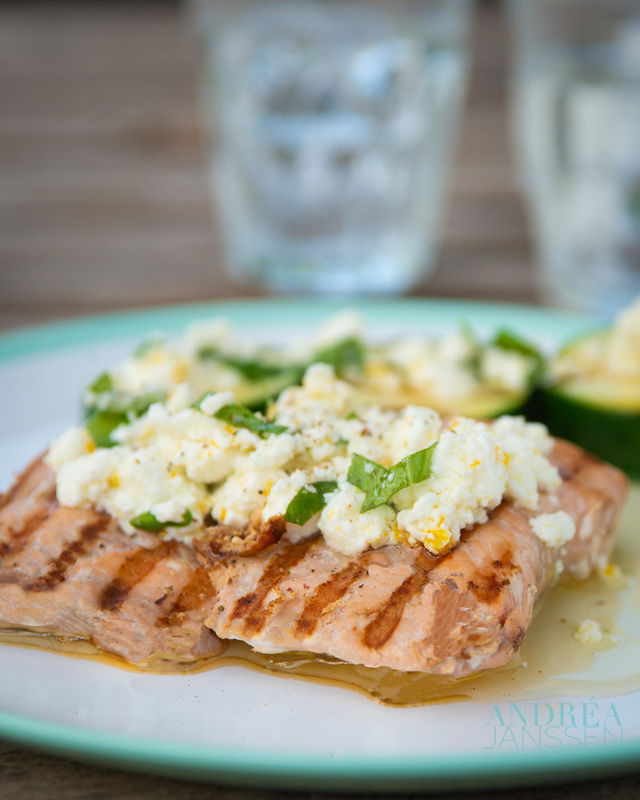 The tuna and feta give an extra flavor accent, with the lemon and oregano. This dish, easy to prepare is a winner! Preheat a frying pan on high heat and pour in the oil. Bake the onions, for about 3 minutes, add the sugar and garlic and stir and bake for another 2 minutes. Cook the pasta according the manufacturers instructions. Pour the lemon juice into the sauce. Stir the tuna through the sauce. Crumble the feta on top. Add salt and pepper at taste. Serve the pasta with the sauce. Refreshing! That is, in one word summed up the flavor of this recipe for a Greek cocktail: ouzo with lemon and a pinch of oregano. An awfully nice welcome cocktail for your Greek buffet! This is the last recipe in the series Greek buffet. The ninth and final recipe starts with: the welcome cocktail. At a party belongs a special drink that perfectly match your buffet. A drink that completes the whole. A welcome drink immediately sets the spirit of the party. Now of course you can serve the national Greek drink called ouzo. Not a bad choice, even very Greek, but you can spice up your cocktail a bit. Some lemon for extra flavor and a fresh sprig of oregano which you can use as a stirring rod. Tomorrow I will summarize the buffet for you, including a timetable, to make sure that it you’ve got a great party without any stress. ouzo is strong stuff, use small liqueur glasses. You will see that that is more than enough. This cocktail is tasty when it is served cold, so put theouzo in the refrigerator to keep it cold. To vary you can use also use lime instead of lemon. cut the herbs from the garden and put them wrapped in a damp paper towel covered with a layer of plastic wrap in the refrigerator. That way they will stay fresh. Fill the glass with the cold ouzo. Insert a sprig of oregano into the glass and serve. Creamy yogurt ice cream with caramelized walnuts and sweet honey. A terrific end of a Greek buffet. After a fully filled buffet table loaded with all sorts of Greek food, the last serving plates are scraped. The buffet dishes are balancing like real acrobats on the counter, working hard not to fall. The cutlery is already soaking in the sink filled with lots of shiny bubbles because of the excess detergent that is just squirted in the water. Gosh, again I squeezed too hard in the bottle. Nearly satisfied and quite expectantly the guests are watching me: “What more would she offers us?”. With a steady pace I walk to the freezer and pull out a big box. That promises a real good ending…. That’s about how I ended my Greek buffet which I served. That had to be brought to a spectacular end. And besides the homemade baklava, I had another surprise in store: homemade Greek yogurt ice cream (made without ice cream machine) with caramelized walnuts (you know the ones that so deliciously melt on your tongue) and a drop of honey. you do not use an ice cream machine, you add some whipped cream to get air into the ice. you love crunchy walnuts, but certainly do not want to burn them, stay near the frying pan while you bake them (believe me from experience I know you should). the only sauce you use on the ice cream is honey, so look for a delicious sort. I chose a thyme flavor honey, because it fits very well with the Greek cuisine and got a delicious taste. Prepare the ice cream one week in advance and store in the freezer until use. caramelize the walnuts and store them in a sealed, airtight container. Whip the cream with the honey until stiff. Fold the cream with the salt into the Greek yogurt with a spatula. Pour into a freezer box and put in the freezer for at last 4 hours. Melt the butter over low heat in a skillet. Sprinkle the sugar on top and stir well. Keep stirring otherwise it burns. When the sugar has melted, you take the walnuts out of the frying pan and place them on a baking sheet. Spoon a scoop of ice cream in the glass. Sprinkle with walnuts and a drop of honey. This recipe for chicken souvlaki includes delicious spiced chicken, served with a crunchy lettuce in a pita bread. Of course with a delicious dollop of homemade tzatziki sauce. Souvlaki is a typical Greek dish. It is made from either lamb, pork or chicken. It is eaten grilled over a charcoal fire and most of the times in Greece with pita bread. And that is exactly what we are going to do with the Greek buffet. The souvlaki let deliciously marinated with herbs, honey and lemon. In addition, we serve a homemade tzatziki sauce. you add lemon juice to the marinade, the meat is nice and tender. But don’t marinate longer then 20 minutes. The lemon will break down the meat to far and it could fall apart. your grilling meat, it gets extra flavor. To ensure that the meat does not burn when grilled, you add oil to the marinade. it is cooked on the grill it’s also a great dish for the bbq. You can also put the chicken meat on skewers. Make the marinade, put in a jar and tighten the lid. Store at room temperature until use (not in the refrigerator because of the oil). Cut the chicken into cubes and store covered with a plastic foil in the refrigerator. Preheat the oven and bake the pita breads until done. Cut the chicken breast into 2 x 2 cm cubes. Make a marinade of olive oil, lemon juice, honey, parsley, oregano, salt and pepper. Put the chicken in the marinade and mix well. Let everything marinate for 15 minutes. Grill the meat on the barbecue (in a special scale) or in a grill pan and fry the meat in the pan until it's golden brown and done. Fresh, delicious and slightly sou, that is the flavor of this cucumber salad. The dill and yogurt gives it a delicious Greek touch. Besides the salad skewers I also served a delicious cucumber salad with my Greek buffet. By using yogurt and dill which are delicious seasonings that really belong to the Greek cuisine. By mixing the yogurt with real fruity olive oil from Greece, the whole gets a bit lighter. you use yogurt and olive oil as a dressing you don’t want any extra moisture from the cucumber. You therefore halve the cucumber and scrape the seeds out. you really want to go Greek all the way, you use creamy Greek yogurt. If you want to make the skinny version, you buy some skinny yogurt and pour the yogurt in a cheesecloth which you hang above a bowl, so a lot of moisture will drip out. After one night, you get a thick yogurt with got a creamy flavor, but slightly fewer calories. you want the best olive oil from Greece, take one from the region of Kalamata. This olive oil is very fruity and fits well with this recipe. Make the salad in the morning. Cover with plastic wrap and store in the refrigerator until the buffet starts. Wash the cucumber and cut in half vertically. Scrape the seeds out with a spoon. Cut the cucumber in half moons of approximately 0.5 cm thick. Make a marinade of Greek yoghurt and olive oil. Ris the dill and mix the leaves with the yogurt. Mix the marinade with the cucumber and let everything come at taste in the refrigerator for at least 1 hour. Greek Moussaka, eggplant combined with minced beef and spices in a delicious rich tomato sauce, covered with a creamy béchamel sauce. During a Greek buffet, one dish should not be missed: Moussaka. Now you may think this is a dish that originated from the Greek cuisine, but in reality it is originally a Turkish dish. It is often made with minced lamb meat, but with this Greek buffet, I opted for beef. Moussaka is a dish that contains layers of eggplant, minced meat and tomato sauce. All this is topped with a creamy béchamel sauce. And of course we make all the layers in this dish from scratch. The Moussaka you can pre prepare. You assemble it the day before and store it in the refrigerator. On the day of the buffet you put it in the oven for an hour and then you serve it. It’s that simple. you sprinkle the eggplant slices with salt and drain, you get moisture from the egg plant and you can fry them golden brown. you add the flour all at once to the butter so you won’t get lumps. Make sure you get bake the flour-butter mixture for a few minutes to get it done (otherwise you will taste uncooked flour). you want to give the tomato sauce extra flavor, you add 200 ml of red wine. 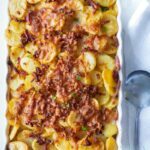 Prepare the tomato sauce and béchamel and put everything into the baking dish. Cover the oven dish with plastic wrap and place in the refrigerator. One hour before the start of the buffet you put the dish in a preheated 180 C oven and bake until it’s done. Cut the aubergines into slices about 1 cm thick and sprinkle with salt. Place on a grill or in a colander and let drain for 30 minutes. Rinse with water and pat dry with paper towels. Preheat the oven to 180 degrees Celsius (if you want to eat the moussaka immediately, otherwise, leave this step behind). Grease a baking dish with a little oil. Heat a little oil in pan and fry the eggplant on both sides until lightly browned and soft. Put on a plate on a paper towel to drain. In a frying pan, pour a tablespoon of oil. Fry the onion for about 3 minutes until they are translucant and add the garlic. Cook for 30 seconds while you stir fry and add the minced beef. Bake until it's brown and done. Add the tomato paste and cook for 2 minutes. Then pour the can of tomatoes and wine into the pan and put the bay leaf on top. Bring to a boil, reduce the heat and put a lid on the pan. Let it cook for 20 minutes, remove the lid and cook further until almost all liquid evaporates. Add the flour at once while stirring. Fry the flour butter mixture for about 2 minutes (keep stirring with a wooden spoon). Then pour in the milk while stirring with a whisk. Add some additional milk if the sauce becomes too thick. Remove from the heat and stir in the egg yolk and grated cheese. Take the baking dish and place half of the sliced eggplant on the bottom. Pour the tomato meat sauce on the eggplant. Put the rest of the eggplant slices on the tomato sauce. Top the moussaka with the béchamel sauce. Bake for 1 hour in the oven, until the top has become golden brown. Greek marinated olives, marinated in garlic and oregano, which gives them a delicious taste: that’s a good snack at the Greek buffet! Olives, salty taste will become extra flavorful if you marinate them yourself with herbs and spices. For this Greek olives I chose garlic, oregano, lemon and a little pepper. By letting them marinate overnight the olives took this delicious flavors into itself. An easy-to-make recipe, which is good to pre-prepare and therefore very suitable for our Greek buffet. you want to make your guests as easy as possible, use seedless olives. Besides the easy bite, the flavor of the spices will become more intense. You want to vary with flavors to add to your olives, you can also add dill, rosemary or mint. your oil can’t be stored at low temperatures, you store it overnight at room temperature. By heating the oil before pouring in the jar, you can easily make this dish a day in advance and the olives will stay ok. Prepare the olives, let them cool slightly and screw the lid on the jar. Store overnight at room temperature. Greek marinated olives, marinated in garlic and oregano, which gives them a delicious taste: that's a good snack at the Greek buffet! Pour the olive oil in a pan. Place the sprigs of oregano in the oil. Cut the garlic cloves in half and add to the oil, along with the lemon peel. Bring to a boil and heat for 1 minute more. Put the olives in a clean jar (with screw cap), and pour the oil on olives. Put the lid loosely on the pot and let it cool. When the oil is cool enough, tighten the lid of the jar. This delicious skewers with tomatoes, feta, cucumber and olives are fresh and handy. Therefore they are a very good choice when preparing a Greek buffet. The second recipe for the Greek buffet: Greek salad skewers. Because they are on a stick, anyone can just take his portion. And through the use of the different kinds of vegetables (form and colour) they look super festive. Make sure you make some extra, because when I had had prepared this buffet the salad sticks were the first that were all gone. The skewers are not very large, you best use the little cocktail sticks. you have to prick the olives on the skewers, you should use olives that are already deseeded. To make it look even better, use a zester to make pretty whorls in the cucumber peel. That will give a nice effect. In the morning: Make the skewers and add the olives, tomato and cucumber. Save the prepared salad skewers in a damp tea towel and store in the refrigerator. Just before serving prick the feta on top. Cut the cucumber into 20 thin slices. Grab a cocktail stick and add first an olive, then a tomato, a cucumber slice and at last a feta cube to it. Place on a serving platter and serve immediately. Kolokithopita, a delicious recipe for a Greek zucchini quiche, of course, shouldn’t be missed at a Greek buffet. These savory quiche with feta cheese, oregano and mint is a winner. The Italian buffet is highly appreciated by you, my readers, as are the other entertaining recipes, so I decided to add a new buffet namely the Greek buffet. Of course, with a time table at the end to make it easy to prepare. And today we kick off with Kolokithopita. A delicious Greek zucchini quiche. 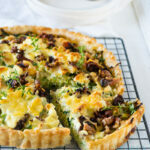 The quiche is flavored with feta, oregano and mint. When you prepare it in advance and then freeze the quiche you only need to heat the quiche in the oven when serving the buffet. No worries. feta cheese is a protected name. You may only call it feta when it’s made according to traditional methods in certain parts of Greece. It also must be prepared from sheep milk. Therefor real feta cheese can be a problem to buyn good (or only very expensive). At a buffet, where you often have to make larger quantities that can be a no go. In this case, use white cheese cubes. The taste is slightly different from the original feta, but the price is certainly more attractive. you use layers of filo dough where as you rub oil in between, you get an airy and crunchy layer. you let the zucchini grate drain before you start preparing the quiche, the quiche will be firm and not soggy. Make the quiche and bake it for 15 minutes. Let the quiche cool and wrap in plastic. Put the quiche in the freezer. Bake the quiches 25-30 minutes in a preheated oven at 180 degrees Celsius and serve immediately. The quiches do not need to be defrosted. Grate the zucchini coarsely and leave it for one hour in a colander to drain. Then push the zucchini with a towel to remove excess moisture. Mix the zucchini with feta, herbs, shallot and eggs and add salt and pepper at taste. Grease the baking pan with olive oil and place the first sheet of phyllo dough in it. Brush it with a little oil and put the second sheet on top. Repeat for five sheets, so you get a bowl for your filling. Spoon the zucchini mixture into the tin and press lightly with the back of a spoon. Lay a sheet of filo dough on the zucchini stuffing and cover the quiche with this. Brush with olive oil. Repeat until the filo dough runs out. Place the quiche in the oven and bake for 15 minutes (if you want to freeze him) or until done in about 30-35 minutes. your dressing contains sufficient moisture you don’t want to add any more through the cucumbers. Therefor you scrape out the seeds with the back of a spoon. Otherwise, the dressing will become watery. you want a nice creamy tzatziki you use Greek yogurt. Would you prefer a more skinny tzatziki, but with the creamy touch, then buy a low-fat yogurt, and thicken it. Therefore place a sieve over a bowl. Place a cheesecloth in the sieve and pour the yogurt in it. Let it drain overnight. you don’t have fresh dill, you replace it with one teaspoon dried dill. Tzatziki is delicious with Greek dishes such as gyros or souvlaki. But it is also delicious as an side dish, for example at a bbq. make the tzatziki and store it covered with plastic foil in the refrigerator until use. Chop 4 sprigs of dill leaves finely. In a bowl mix the chopped dill, olive oil, lemon juice, sea salt, garlic and yogurt. Put in the refrigerator until you need it. Halve the cucumber. Scrape with a teaspoon the seeds from the cucumber. Cut the cucumber in half moons. Serve garnished with a sprig of dill on top. The February Daring Cooks’ Challenge was hosted by Audax of Audax Artifex. The challenge brought us to Greece with a delicious, flaky spanakopita – a spinach pie in a phyllo pastry shell. I didn’t to the daring kitchen challenges for to long and I suppose it was time for me to get started again, because it’s a lot of of fun to do and I learn new recipes and flavors. All members share their special recipes from their country of childhood and they are most of the time quite a suprise and very tasteful. This month we baked spanakopita, a Greek dish I’ve never eaten before. It was not to difficult to make and the flavors were very rich. This is indeed a dish I’m going to make more often. And I will share the recipe with you, that Audax written for us. Thanx Audax! I didn’t use the garlic clove and didn’t miss it either. Preheat oven to moderately hot 375°F/190°C/gas mark 5. Wash the spinach and dry thoroughly, discard the tough stems, chop or tear the leaves into pieces, place into a large bowl. (If using thawed chopped frozen spinach just place into a large bowl). Add the chopped onions, chopped leek, finely chopped dill, four tablespoons of extra virgin olive oil, the crumbled feta cheese and the optional garlic and nutmeg. Using your hands vigorously massage the filling ingredients until the mixture loses about half to three-quarters its original volume. Over a bowl or a large plate squeeze large handfuls of the mixture till they feel dry, continue until you have done all of the filling mixture, and you have collected all the excess liquid. Cover the excess liquid with enough breadcrumbs to absorb the liquid. The breadcrumbs should be moist. Return the moisture-laden breadcrumbs back into the filling mixture. Add an egg (or two depending on how dry the mixture is) and mix well using your hands. Taste, season with some salt (careful feta contains lots of salt) and plenty of pepper. Set aside. The filling can be stored in the fridge for a day or two if well covered. Brush oil or melted butter on the baking dish. Cover the phyllo sheets with a damp tea towel. Cut (with a knife or with scissors) the phyllo sheets to the correct shape for your baking dish. Cover the sheets with the damp tea towel until needed. Butter (or oil) every second sheet, cover the base and sides of your baking dish making sure that the sheets overhang the edges of the baking dish. Use about ten “thin-style” phyllo sheets or about six “thicker-stye” phyllo sheets for the base and sides. Spoon the filling into the phyllo pastry case. Use four to six more “thicker-style” phyllo sheets or about eight “thin-style” phyllo sheets to cover the top, butter each layer. Use a spoon or similar to neaten the edges of the pastry case. Bake in a preheated moderately hot oven for 30 mins up to one hour (depending on the depth of your baking dish). Cover with foil if over-browning. Check for doneness by using a thin knife, insert it into the spanakopita for 30 secs, the filling should feel set and the knife should feel hot to the touch. Cool for 30 minutes. Can be eaten hot or cold. Here in the South of Holland, we still got vacation. Just one week, but we’ve got such a beautiful weather so it’s great. And the weather forecast for the coming week is also very nice. So it’s time for yet another vacation recipe. This time nothing with a skewer, but a real nice salmon fillet. In the South of Europe fish is often very fresh and easy to buy. For the Mediterranean effect we serve this with a feta dressing. And it’s served with zucchini from the grill, also covered with the same feta dressing. The real Feta cheese is, of course, the tastiest. It comes from Greece and can be made from raw milk. So be careful when you are pregnant (always read the labels correctly). If you can’t get it, you can buy white cheese cubes in the supermarket. Less strong in taste, but still very tasty. When in a recipe lemon zest is mentioned, use a biological lemon. Grate only the yellow part of the lemon. The white that is underneath is very bitter. Cut the zucchini not too thin for the firmness and to retain enough flavor. By allowing meat and fish to rest for a while after baking or grilling, fewer juices will be released after cutting, which remain in your meat or fish. So much better. Crumble the Feta with your fingers in a bowl. Cut the basil in very small strips. Grate the lemon peel, only the yellow part, not the white. The white part is very bitter. Mix the feta, grated lemon, 1 tablespoon of lemon juice and the basil. Add enough olive oil until you get a soggy mixture. Slice the zucchini in about 1.5 cm thick pieces. Coat the courgette with olive oil and sprinkle with salt and pepper. Brush the salmon fillets with olive oil and sprinkle with salt and pepper. Turn on the barbecue. Grill the salmon fillets on both sides until they are done. Put on a plate, so the juices can set in the fillet (it's better for the taste). Meanwhile grill the zucchini on both sides, until it's brown. Take a plate and put a salmon fillet and a few slices of zucchini on it. Spoon the feta dressing on top of the zucchini and salmon fillet.